Scone Palace and the Scottish Game Fair. 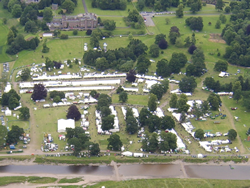 The Scottish Game Fair is the biggest country sports event in Scotland. Large numbers of fishing, shooting and conservation enthusiasts flock to the grounds of Scone Palace from all over the UK to enjoy the spectacle and the atmosphere of "the friendly fair". 2010 dates are July 2, 3 & 4. Expected attendances exceed 30,000 to see the exciting events in the Main Arena, shop around the booths, enjoy the food, the atmosphere and talk about the things they love best, the countryside and its many pursuits. Fly fishing competitions include trout distance and accuracy which are sponsored by Orvis UK, salmon fly distance casting sponsored by The Kenmore Hotel, and the Game Fair Challenge Trophy which is sponsored by Sharpes of Aberdeen and combines all of these disciplines. Prizes are awarded to the winners of each competition in three categories each day, gentlemen, ladies and juniors. 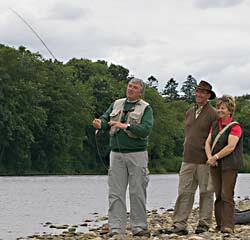 The Kenmore Hotel sponsored Scottish Spey casting championship is probably the fairest of all such competitions because all competitors must use the same rods, reel and lines supplied and the casts have to change direction by approximately 45 degrees. So winning is down to skill (and luck with conditions). Rods, reels and lines are provided for the competitions - all you have to do is turn up and have a go. Ally manages the fishing competitions, tuition and and demonstrates fly casting and fly fishing techniques on the river and in the Main Arena. Also demonstrating and teaching is ex World Champion caster and Scottish Game Fair regular James Tomlinson from Ayrshire. Fly casting tuition is available throughout the three days at bargain prices £5 for adults and £2 for children between 11 and 15 years old per fifteen minute session. 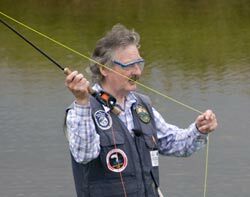 All instructors hold coach licenses and most of them are members of the Federation of Fly Fishers, the most respected fly fishing instructor certified body in the World. Don't miss out on a great opportunity to learn from the experts. In addition to the fly casting demonstrations, competitions and tuition the Fair caters for all country sports, skills and pastimes. There are always numerous vendors of fishing tackle and books including several specialist dealers who can value vintage fishing tackle. Fly tyers will especially like the opportunity to purchase specialist high quality materials seldom seen in shops and of course there are the bargains to catch, rods, reels lines, clothing and everything that the fisherman could wish for.